Grab a box of Kleenex and get comfortable you guys, because you're about to be moved. The first time I became acquainted with the flash mob was probably about five or six years ago on YouTube. Back when "going viral" actually meant something and we appreciated an honest day's work. Actually, no. No I don't. I vaguely remember seeing a YouTube video set in a library with some musical theater kids bursting into some disney song or something. But nevertheless, like the rest of America, I was infatuated. The choreography I'd surely never be able to execute, the collaboration of hundreds of people for a common goal of DANCE, the looks on the unknowing spectators' faces when one person starts dancing alone and suddenly seemingly-ordinary passers-by join in, revealing they were in on the joke ALL ALONG... where's bad? The flash mob grew in popularity with rapid determination, never discriminating between who could participate. Any man, woman or child who had the ability to construct even the loosest definition of jazz hands with rhythm exceeding that of a chimpanzee was invited. It was everywhere. In shopping malls, in university common rooms, theme parks--basically anywhere there is a large gathering of people. Soon the flash mob became not just a three-minute dose of joy for disgruntled patrons of the Gap, but a vehicle for marriage proposals and…um...probably other things, but mostly marriage proposals. It was the perfect way to get your friends involved and surprise your bride-to-be simultaneously. Unfortunately, all good things must come to an end. What started as a celebration of human happiness everyone was secretly scribbling onto their bucket lists spiraled into it's-no-longer-cool-if-everyone's-doing-it-ville, much like Facebook or listening to Gotye. Exclamations of "Oh! A flash mob!" accompanied with extended viewership became "Oh...a flash mob" and a bee line towards the Sunglass Hut. Sadly, this happens to all things innovative and cool. Eventually they are run into the ground by everyone on the planet. And that's not the flash mob's fault. It brought joy to many, it starred in its very own TV show hosted by Howie Mandel, it united many a betrothed couple, but all good things must come to an end. It's time to say goodbye. You were a good trend--much better than planking or the Macarena. May you live in infamy. 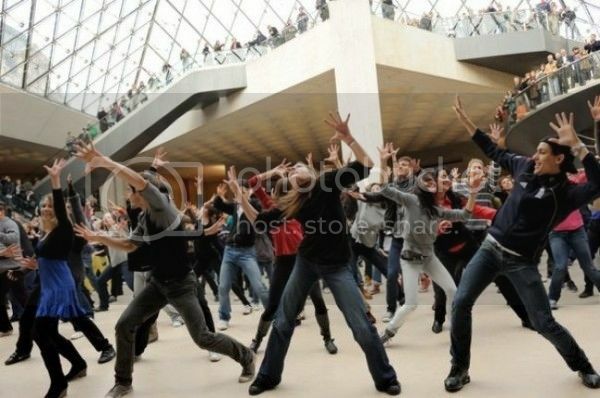 Have you ever been a part of a flash mob? Let's share our stories to honor its memory.